The 1960's saw the world explode in a political and cultural revolution. In the United States civil rights activists and anti-Vietnam War protesters took to the streets, France saw a general strike that nearly ground the country's economy to a standstill, Ernesto "Che" Guevera preached his doctrine of global revolution, while in China Communist leader Mao Zedong set off his own cultural revolution. Japan was by no means exempt from this tumult, in the country was nearly torn apart over The Treaty of Mutual Cooperation and Security between the United States and Japan, known in Japan as Anzenhoshō Jōyaku and subsequently abbreviated to ANPO. Hundreds of thousands took to the streets to voice their opposition to the Treaty signed on January 19th, 1960 that tightened Japan's political ties to the United States and would allow U.S. military bases to remain on Japanese soil. Many saw this as an attack on Japanese sovereignty, left-wing members of the Japanese parliament had to be dragged from chambers, many demonstrators were injured, some even lost their lives; but for a young Linda Hoaglund, the daughter of American missionaries, the conflicts went on virtually unnoticed. "I had led a very sheltered life." Hoaglund says of her years growing up in Japan,"Although I was out in the provinces and although I did go to Japanese school, so in that sense I was very much on the front lines of the Japanese lived experience, but I barely knew about the Vietnam war, I didn't know anything about the protests believe it or not." Hoaglund has subsequently explored this secret history of the country of her birth in her directorial debut "ANPO", a film that sees these massive protests through the eyes of the artists, photographers, film-makers and playwrights who lived through the period. The documentary brings together nearly 175 works, not only from the 1960's but right up to the present day, all created by artists who've made Japan's ambivalent relationship with the United States the crux of their work. Hoaglund, one of today's most sought after film translators, had in many ways become an honorary Japanese by spending the first 17 years of her life in the country, but this came with the same road blocks that many Japanese face when it comes to being educated about 20th century Japanese history. "They have tried to hide whatever part of their history is inconvenient including, I would say, this amazing history of resistance that began in 1960." So as Hoaglund would leave eventually leave Japan, study at Yale University and eventually work on translating and subtitling 140 Japanese films, including Kiyoshi Kurosawa's "Bright Future", Hirokazu Koreeda's "After Life" an Hayao Miyazaki's "Spirited Away", this seismic period of Japanese history remained a mystery to her, and consequently enough, only began to be reveal itself to her through Japanese cinema. 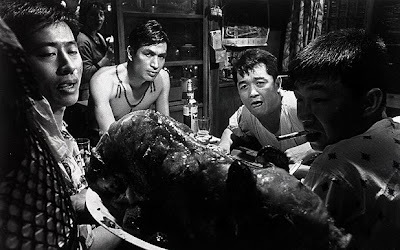 "I think my first glimpse that something had gone terribly wrong in 1960 was when years ago MOMA had a Shohei Imamura retrospective and it was chronological . I was just flabbergasted, because I had seen "Pigs and Battleships", but the tone of the film he made before that ["My Second Brother"] was so like... We're really poor and I'm an orphan in a coal mine, but I have hope for tomorrow. It wasn't communistic, but it was socialistic idealism, and it was very optimistic about how we may not have money but we have hope and we have each other. And to cut from that to his next film "Pigs and Battleships" which as my editor [Scott A. Burgess] said is the darkest film he's ever seen in his life, with the subject of U.S. military presence in Japanese ordinary life and its corrosive impact. That was my first tip off and I thought what on earth could have happened that depressed this film-maker so much?" Hoaglund would continue to uncover signs of this great societal schism around the ANPO Treaty in the films of Nagisa Oshima, Yasuzo Masumura and even Akira Kurosawa, but even bigger clues as to how ANPO scarred the Japanese psyche came from the world of fine arts. Two artists in particular sparked Hoaglund's artistic exploration of the period. Hoaglund recalls how five years ago a rare book dealer friend sold her a collection of photographs by Hiroshi Hamaya which featured images from the 1960 protests. "Those images were so powerful and they really stayed with me and I wanted to find out where those faces had come from and what had happened to them." Shortly thereafter Hoaglund discovered the work of artist Hiroshi Nakamura, a man she calls "Japan's Picasso", by seeing a documentary about his work on Japan's national broadcaster NHK. 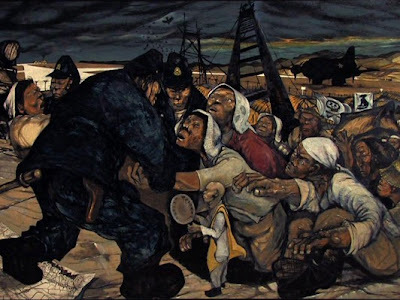 "They showed the painting ["Sunagawa No. 5"] of the police struggling with the peasants and my jaw dropped, I was like... Wait a minute! I thought I know a lot about Japanese contemporary art, but who the hell is this guy?! Partly it was interesting to me because that painting in particular, I think if you show that painting without saying anything to anybody not that many people would guess that it was a Japanese painting. So, literally as soon as the show was over I went to the museum and saw this full retrospective of this astonishing artist." While Hoaglund continued to piece absorb the power and beauty of Hamaya and Nakamura's works as well as the world of protest they depicted she was called on by prominent M.I.T. History Professor and author John Dower to create a unit for his online image-driven scholarship source Visualizing Cultures. "I said I want to do ANPO. Then I showed him the Nakamura paintings and Hamaya photographs and he was just stunned. She did have one stipulation though, "I said I want to make the film first." That of course meant digging deeper into Japan's political and artistic past. "Fortunately we have something called Google," Hoaglund jokes, but in an age when information is at everyones' fingertips she could have never guessed at how huge a subject she had taken on. "I had no idea when I started researching how many painters I would find," she admits. These would come to include painters Chozaburo Inoue, Shideo Ishii, Tatsuo Ikeda, Kikuji Yamashita, photographers Eikoh Hosoe, Miyako Ishiuchi and Mao Ishikawa, multimedia artists Sachiko Kazama, Makoto Aida and Chikako Yamashiro and pop artist Tadanori Yokoo. The one artist that Hoaglund regrets she couldn't include in the film is film-maker Nagisa Oshima, the director of "Night and Fog in Japan", "Cruel Story of Youth" and "The Ceremony" who has lived in seclusion since suffering a series of debilitating strokes. "He's a towering intellect and a man who never sold out." The wealth of history, stories and gallery of artwork that Hoaglund assembled for her film resulted in a huge challenge, "How to wrestle this gigantic treasure trove down to the ground." Although Hoaglund had had experience working in film before as the writer and producer of Risa Morimoto's 2007 documentary "Wings of Defeat" she still needed some help to tackle the immensity of her subject. "I was actually really stuck about a year ago," she admits, "I had a 2-hour, 10-minute cut that I knew was way to long. I hate feeling exhausted when I come out of a movie. I think the best way I want to come out of a movie is "Wait a minute, what was that? I have to see that again!" and figure out how that is put together." Although Hoaglund says she took special strength from the example of late director Kinji Fukasaku during the making of "ANPO" ("I learned so much from just being in his presence and also from subtitling 15 of his films") it was her friendship with "Face" and "Chameleon" director Junji Sakamoto that proved most valuable during the film-making process. "He didn't give me detailed notes, but what he said was your film is way too meticulous. Shock the audience, get rid of everything that's already in history books and grab them in the first 15-minutes. And that that was feedback on how to make a great fictional film." The result is a film that Hoaglund describes as "a cinematic collage", one that has not only captured the attention of general film audiences, but also the world of fine art. Not only has "ANPO" been featured in an 8-page spread in the January 2011 issue of Art in America, but the inclusion of Hoaglund's film in the 2010 Vancouver International Film Festival has led to a major exhibition for one of the "ANPO" artists. 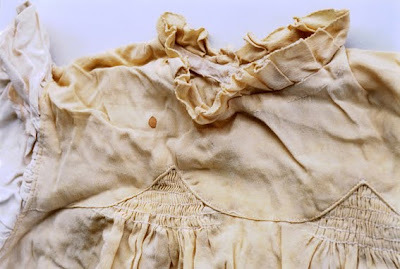 "The Museum of Anthropology at UBC recently expanded and put in a 6,000 square foot exhibition space for fine art and believe it or not starting in October Ishiuchi-san Hiroshima series, 52 of the large photographs, are going to be exhibited there for five months." Miyako Ishiuchi's "Hiroshima" series consists of haunting large scale photographs of clothing that that was worn by survivors of the atomic bombing of the city. "They're going to put huge posters of her work in all the bus shelters in Vancouver, which I think will cause something of a storm," Hoaglund says excitedly, "I mean I think she's one of Japan's finest artists." Beyond the enthusiastic welcome by the arts community the reactions that Hoaglund is most touched by are those from young Japanese who, like her many years ago, have no clear knowledge of the vents that shook their country a half-century ago. "I think one Japanese young person put it best, she said you know, after watching this movie it's sort of like if you have an illness that no doctor had been able to diagnose and suddenly a doctor comes along and says this is your illness and this is why you're sick. That was the effect of watching 'ANPO' on her. So 'ANPO' is my way of saying don't stay sick! And that's why I ended the film with Ishiuchi saying 'I refuse to stay wounded.' I believe saying 'I refuse to stay wounded,' is the beginning of so many things - it's the beginning of much great art, it's the beginning of therapy and it's the beginning of personal transformation."